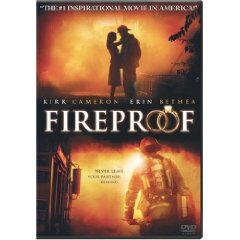 We just rented the movie “Fireproof” and watched it with our daughter Emily today. If you haven’t seen it, SEE IT! Produced by Evangelical Protestants, it has their distinct flavor, preachiness, and lingo, but the story is good, well played out and it should be watched by husbands and wives the world over — especially those that have not been as close as they should be lately. I have to admit it teared me up more than once. I just ordered a copy on DVD since it is one every family should own and make sure their kids watch — especially their married ones. I’ve seen it, and it also teared me up. The thing I thought was really awesome is that in the kissing scene, instead of kissing the actress playing his wife, the scene was slightly silhouetted and Kirk Cameron was kissing his real wife. He said he wouldn’t kiss a woman that wasn’t his wife! If only more people respected their spouses like that! I believe I already commented on this but it may have ended up in cyberspace…oh well, I am technologically challenged anyway…I agree with the other comments, especially about the kiss, which I did not know about. I was a little uncomfortable with the movie as a whole, because I am a recovering evangelical, newly becoming Catholic, and the movie just had a certain intense evangelical ambiance to it. Or is it my heightened sensitivity? Also, not all married women who work outside the home give in to temptation such as depicted in the film. Since Christmas time I have transitioned from Calvary Chapel to the Catholic Church. Words cannot describe my joy–and relief–at being Home. My dear husband of 25 years remains at Calvary but has been incredibly kind and supportive, more than I really think he could be if he didn’t have some leanings himself. Next post: Parish Holy Water Fonts Empty? Full of Sand?